Journalists, a professor, and a group of prisoners brought a civil rights lawsuit against Ohio Department of Rehabilitation and Correction (ODRC) officials on Monday, December 9, asserting that prison officials violated the First Amendment of the U.S. Constitution in restricting media access to prisoners convicted of crimes related to the 1993 Lucasville prison uprising in order to stifle public discussion. 3) The restrictions on media and public access to information are unreasonable restrictions on speech in violation of the First and Fourteenth Amendment. The media plaintiffs are Noelle Hanrahan of Prison Radio, Pulitzer-prize winning journalist Christopher Hedges, James Ridgeway of Solitary Watch, and Derrick Jones, a theater and film instructor at Bowling Green State University. The American Civil Liberties Union of Ohio is representing the plaintiffs. All five prisoner-plaintiffs were framed for homicides that occurred during the 1993 Lucasville prison uprising. The uprising lasted 11 days. Nine prisoners and one prison guard were killed during the uprising. 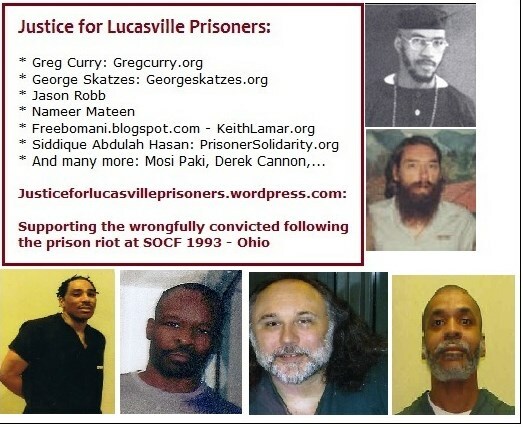 Siddique Abdullah Hasan, Keith Lamar (aka Bomani Shakur), Jason Robb, and George Skatzes are four of the prisoner-plaintiffs who are part of a group collectively referred to as the Lucasville 5-plus. These men were framed and sentenced to death for homicides that occurred during the 1993 Lucasville uprising, and have been held in solitary confinement for the last 20 years, fighting Ohio’s ongoing efforts to execute them. The “plus” refers to the numerous other prisoners framed up in the aftermath of the uprising who received sentences other than death. A fifth prisoner-plaintiff, Gregory Curry, is serving a life sentence after being convicted for a homicide occurring during the riot in a trial fraught with perjured testimony, suppressed evidence, and prosecutorial misconduct. As the state persists in its efforts to execute the Lucasville 5, the fight over historical truth continues as well, with lives hanging in the balance. Access to media in this context involves more than the protection of an abstract right, but instead implicates the most fundamental questions about the humanity of people in prison and the tyranny of the state. The lawsuit claims “Defendants and their predecessors have for twenty years denied all face-to-face media access to prisoners convicted of crimes committed during the April 1993 uprising[. ]” In addition to denying requests by Hanrahan, Ridgeway, Jones, and Hedges for interviews with prisoners convicted of crimes related to the uprising, reporters from the Columbus Dispatch, the San Francisco Bay View, and the Associated Press in Columbus have been denied access to those prisoners as well. In contrast, prisoners convicted of crimes that are unrelated to the 1993 uprising have been permitted to speak with journalists and media workers from WTVG 13 (ABC Toledo), The New York Times, Fox 25 News in Lima, Ohio, French national TV channel France 2, the Edinburgh Evening News, BBC News, Channel 35 in Lima, Ohio, Towers Productions in Chicago, News of the World of Glasgow, Sunday Post of Glasgow, The Times of London, Cicada Films, and WJW-TV in Cleveland, Ohio. ALC will continue to follow this case and support efforts for the Lucasville 5-plus. This entry was posted in censorship, political repression, political rights, wrongful convictions and tagged Lucasville 5 by abolitionist. Bookmark the permalink.